I contemplated not doing any NHL draft rankings or writing this season due to a variety of life events, but I watched a New Jersey Devils’ game recently and I had an epiphany of sorts. The Devils had two rookies in the line-up who I have followed for a long time: Reid Boucher, a personal favourite of mine and Éric Gélinas, a player who always had the size and skills but never seemed to be able to put it all together. For me, the game was like a father seeing his kids succeed in life. As a result, I decided to breakout the spreadsheets and once again reveal some analyses that comes out of THW’s NHL Draft War Room. It will also be interesting to compare NHL Central Scouting’s rankings with TSN’s Bob MacKenzie’s Midterm Rankings to be released later today. Round One: Took the average of the December or January rankings from some of the major scouting services and inserted the player from the European or Goalie rankings where the average suggested. Rounds Two and Onward: For the remaining rounds, I simply inserted 5 European skaters and 3-4 goalies per round based on the results of the 2013 draft. The Quest for Number One? 1. Sam Bennett – Kingston – Centre – 6’0, 178 lb. If you were surprised NHL Central Scouting selected Sam Bennett as the top prospect thus far in 2014, see Brock Otten’s (OHL Prospects Blog) comment below. Sam is that all around player with high-end leadership abilities that coaches covet. 2. Leon Draisaitl – Prince Albert – Centre – 6’2, 208 lb. Leon has the potential to be that big number one centre that many teams are missing – size, scorer, set up man. Ryan Kennedy of the Hockey News has him rated number one. 3. 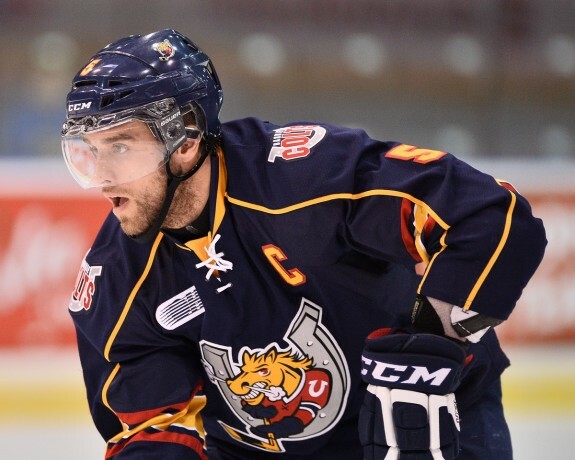 Aaron Ekblad (One-on-One Interview) – Barrie – Defense – 6’4, 216 lb. 4. 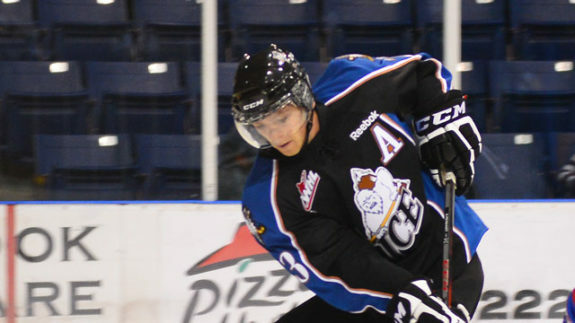 Sam Reinhart (One-on-One Interview) – Kootenay – Centre – 6’1, 185 lb. Sam is a guy with high-end skill and leadership qualities. He was the only 2014 draft-eligible forward selected by Team Canada to play at the 2013 U20 World Juniors. Since he is a centre, he is my bet to go number one. He is the Sam many rankings have as the number one prospect. His Dad, Paul Reinhart, was selected 12th in the 1979 draft and played eleven seasons in the NHL. His brother, Griffin, was drafted 4th overall in the 2012 draft and his brother, Max, was drafted 64th overall in the 2010 draft. 5. Michael Dal Colle – Oshawa – Left Wing/Centre – 6’2, 179 lb. Dal Colle may have the highest offensive potential in this group of five; however, he doesn’t possess the elite leadership and all around qualities of some of the others in this top tier of prospects. Michael does have the ability to turn it up more than a notch and could ultimately still end up as numero uno. The 1st column on the left is players’ rankings based on the combination of NHL Central Scouting Service’s four separate rankings. The 3rd column is NHL’s grade for the player. The 4th column (E-Mac) is Eldon MacDonald’s January rankings. (Not to be confused with THW’s official The Next Ones rankings which will be released at a later date). On the bottom of the table, if you click on “E-Mac January Rankings” tab, the rankings will sort based on E-Mac’s rankings.